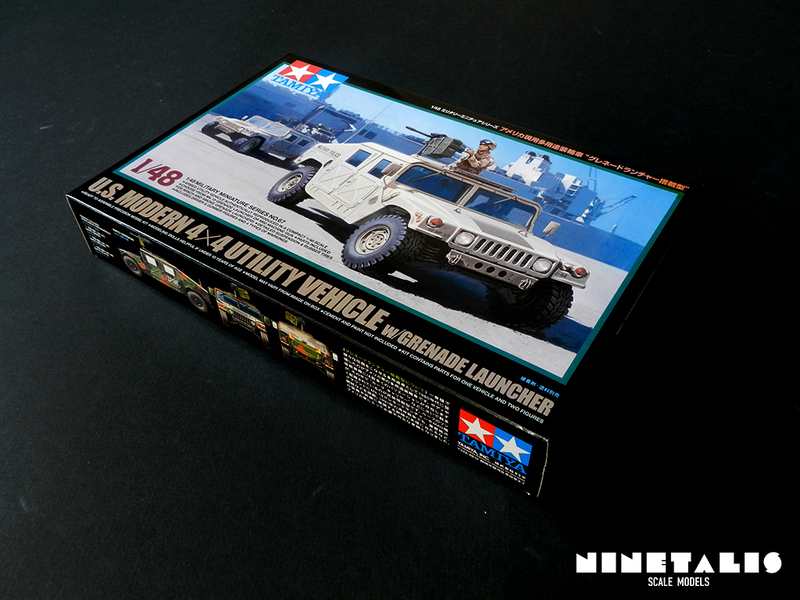 The Humvee or High Mobility Multipurpose Wheeled Vehicle (HMMWV) to be more official, has become the standard transportation vehicle of the US Armed forces since its introduction in 1984. Produced by AM General, it was largely replaced the original Jeep and other utility vehicles of it’s day and their roles. Although its first use was with the United States military, it is now used by numerous other countries and organisations and even inspired civilian adaptations. In total roughly 281,000 units were produced throughout its career. Although the HMMWV is in process of being replaced by other machines like the Oshkosh JLTV, modernisation efforts are being introduced as a transitional solution or for future roles, meaning that the HMMWV is not yet leaving the battlefield for many years to come. 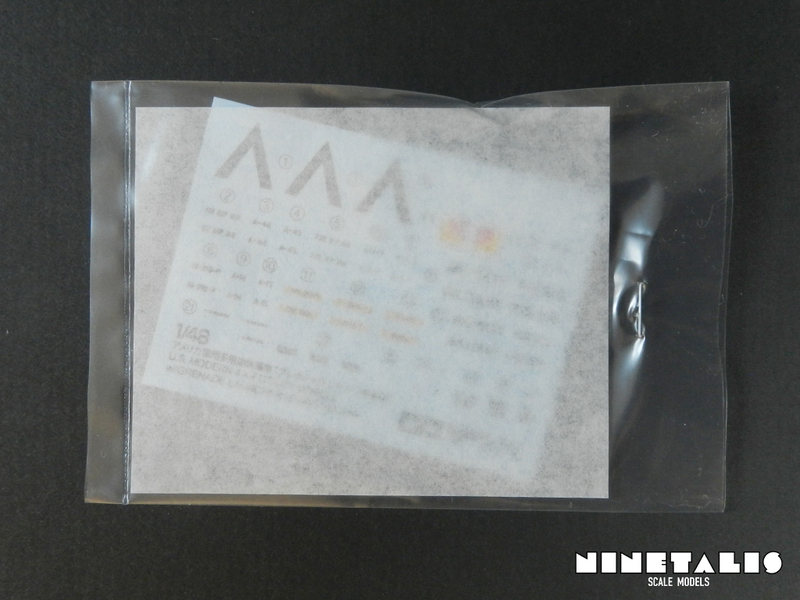 Packaged in the usual cardboard boxing that we know from Tamiya, we get five sprues, in which between them are build up from multiple frames. 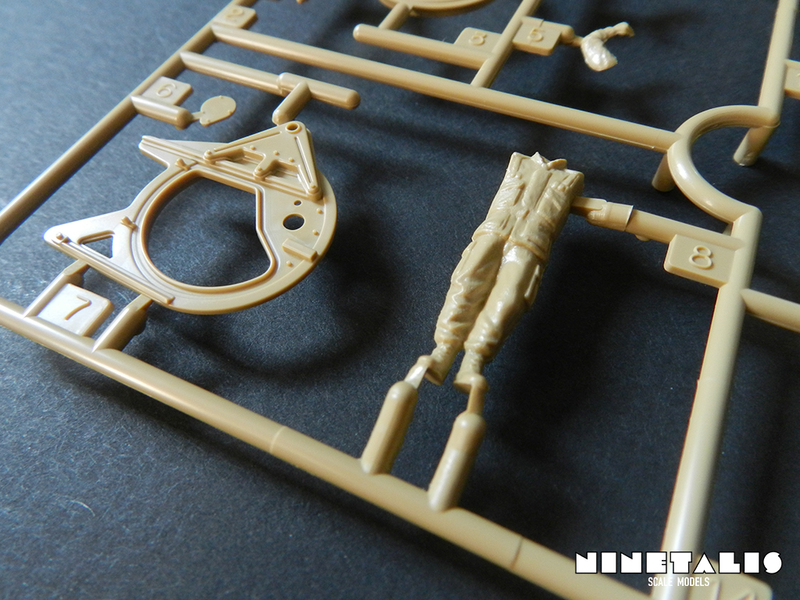 All of the four styrene sprues are in the sand-brown colour that we get with most of their 1/48 armor kits. The hood (or bonnet) of the Hummer is notably molded seperately. Also included is a clear frame and 4 rubber tires. The most prominent absence with this kit seems to be engine, as only the radiator is provided, which would be hidden away anyway. In total there are X parts. Last but not least are also the instructions and a decal sheet providing for four different machines. 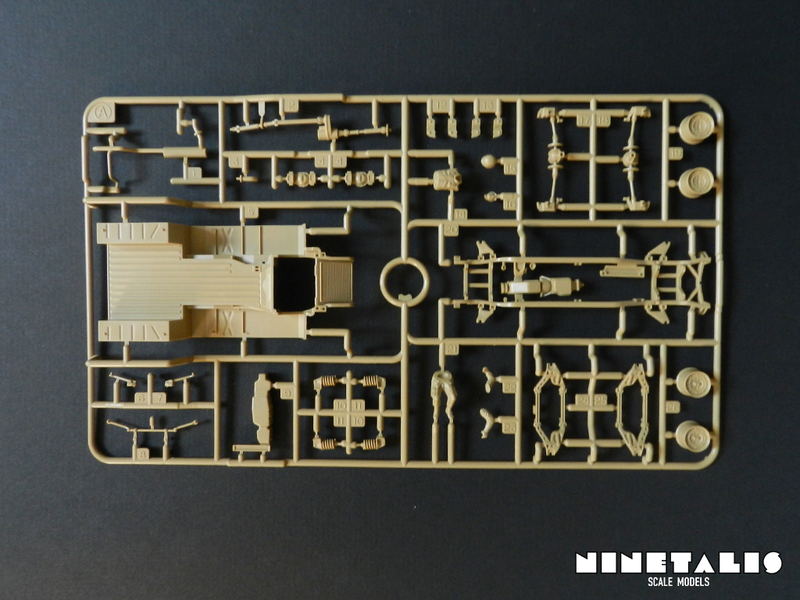 Sprue A provides most of the undercarriage parts of our Humvee. These are the floor plate, chassis, exhaust, driveshaft, suspension and the rims. Also notable is an added figurine which is divided into six parts (head, helmet, torso, two arms and a pair of legs). The detail overal appears to be of very high standard. Detail on the floor plate is also molded on both sides, which can not be said of the main chassis part. 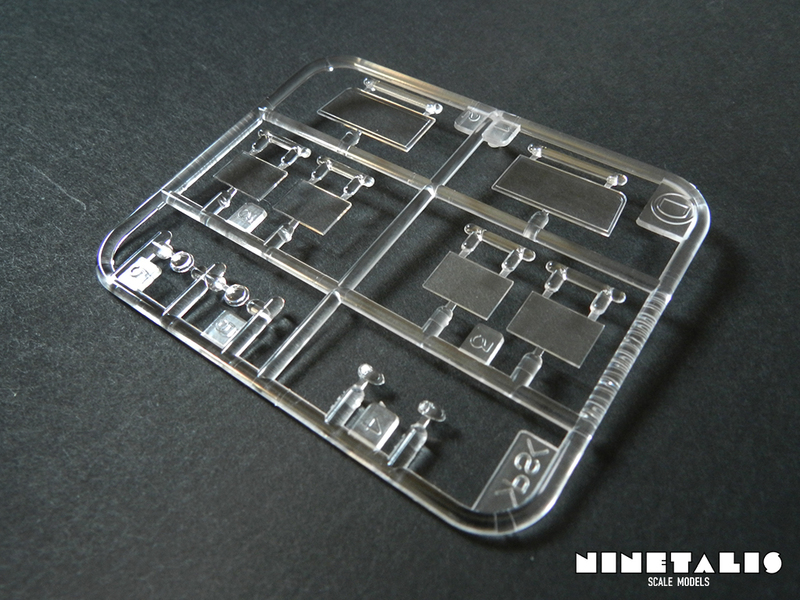 However, I’ve build one of these kits before and once builds there is nobody even going to be able to see the lack of detail there, since you have to glue it directly onto the bottom of the floor plate. 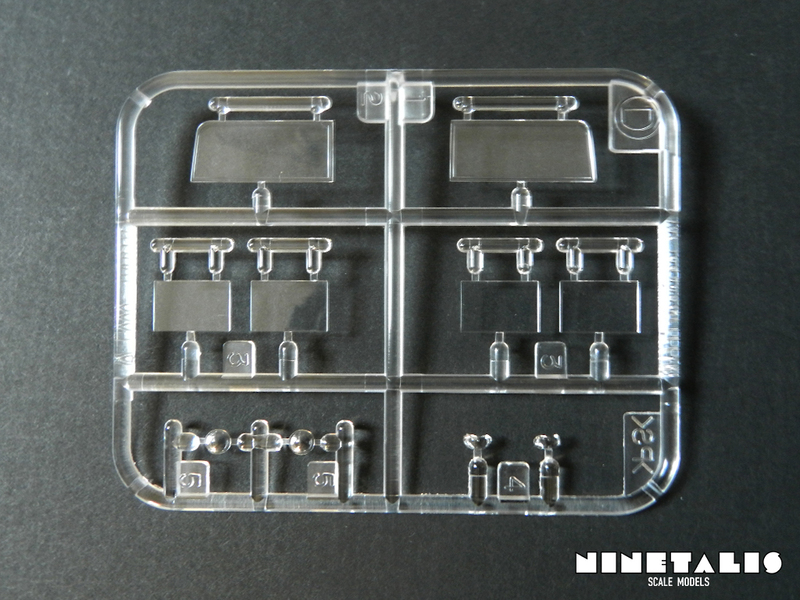 As sprue B and E are packaged together, I will focus on both at the same time. 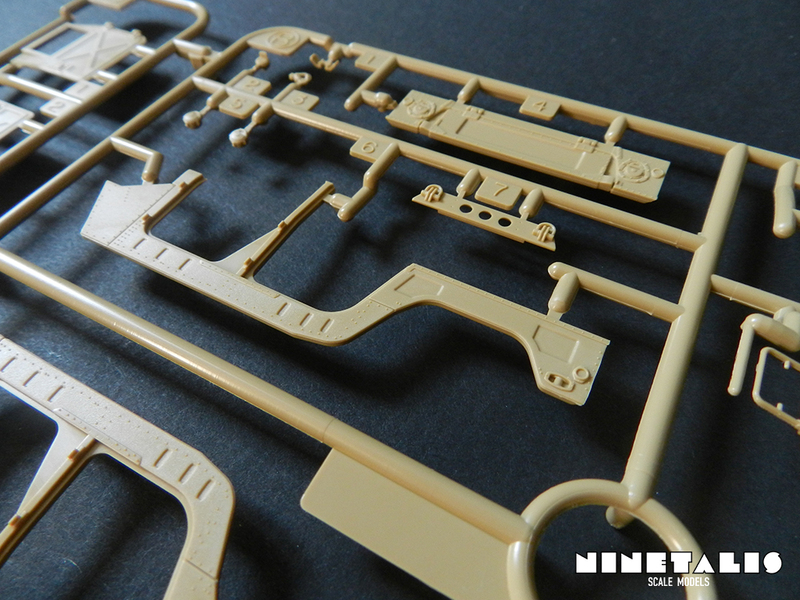 Again as with the A sprue the detail is of very high quality. 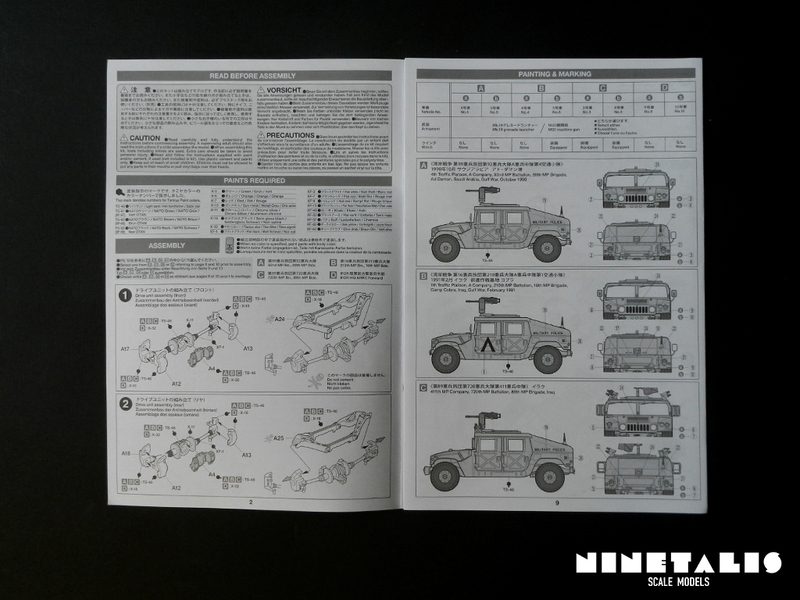 The parts found on the B frame are the main body parts of the Humvee. 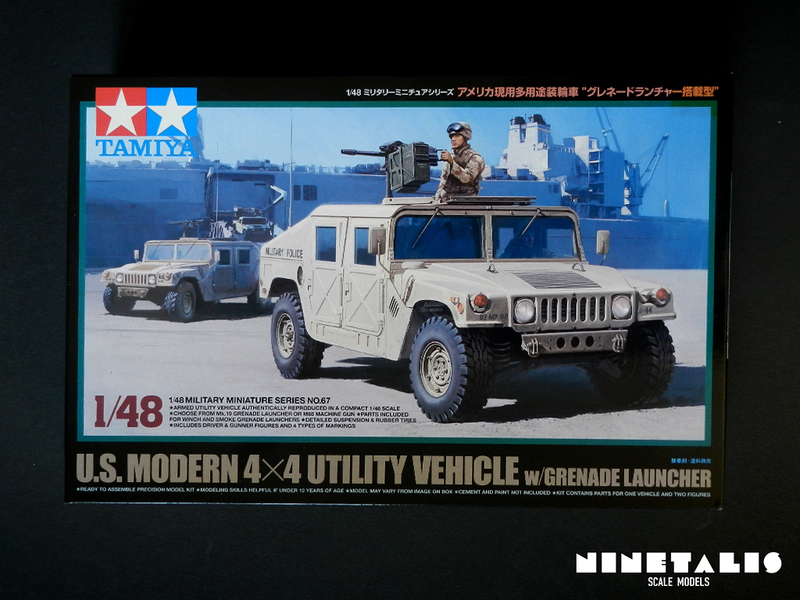 The way that Tamiya has divided the body is quite straight forward, which are both sides, the framing of the windshield and the engine heat shield the back plate. Separately bagged we also have the hood and the doors which are found on sprue E. One negative mark here for Tamiya though, as the back plate, the trunk as well as the lights are molded into one single piece, leaving us no option to but to leave the trunk closed and the lights to be painted. Other parts on the B frame are inside details like the hood radiator, the back seats, the steering wheel, side mirrors and other small bits and pieces for both the in- and outside of the model. The C frame holds the last bits and pieces that go on the outside of our Humvee, which are mainly all the parts for the roof, including a machine gun. Also provided is another figurine, which stands up and is divided into five parts (torso and legs, head, helmet and both arms). The last two frames are also the two smallest, holding mostly small do thats. 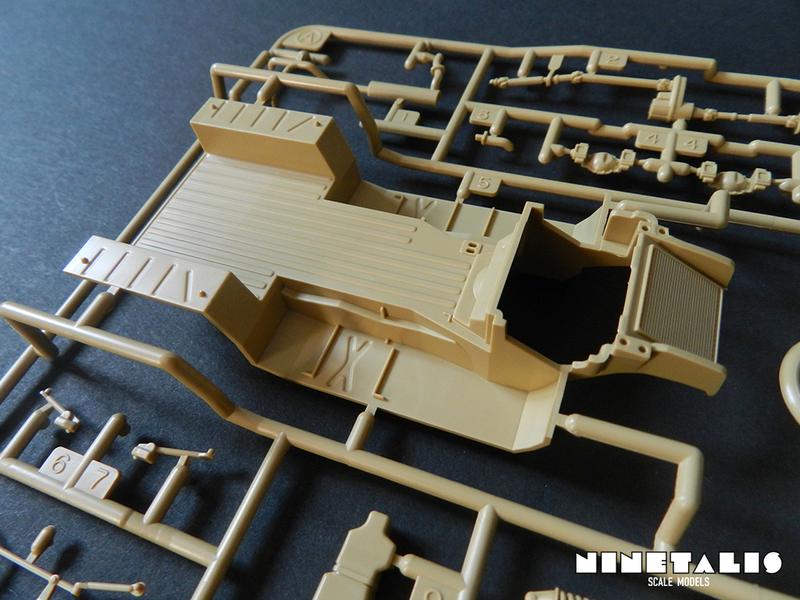 The J frame provides all the parts necessary for the roof mounted Mk.19 Grenade Launcher, including the roof mount. 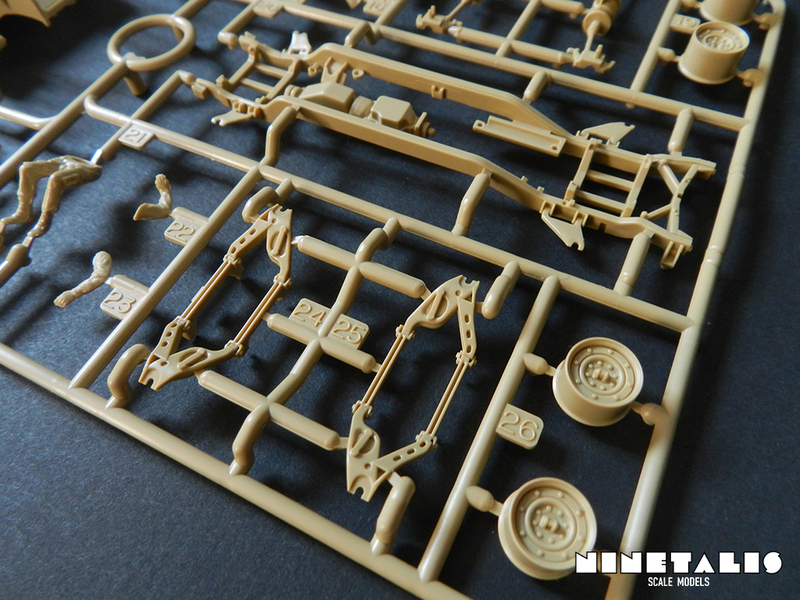 The K sprue mostly provides parts for a winch. The clear frame is quite straightforward and clear of any scratches or damage. It provides the windshield (which is divided into two parts) and those of the doors. Also included are the headlights, but sadly not the rear lights as mentioned before. 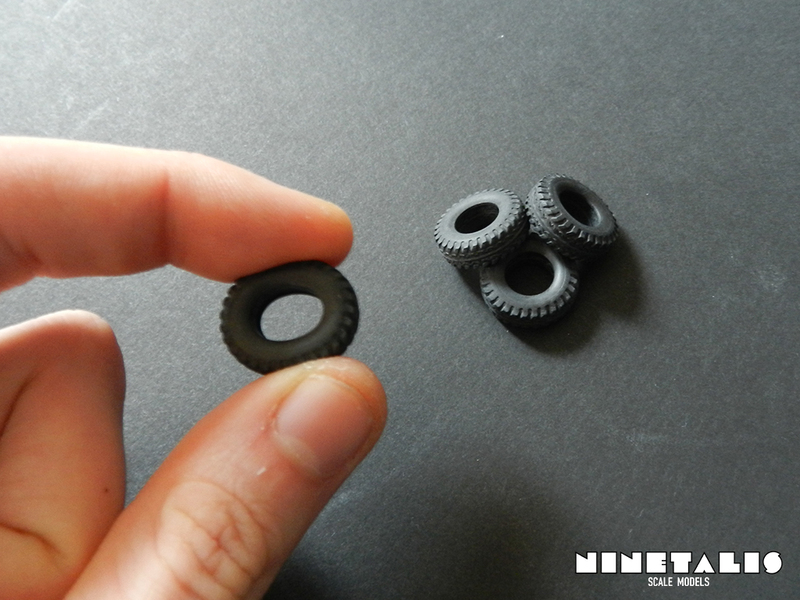 Rather surprisingly for a quarter scale Tamiya kit, the kit also includes four rubber tires. 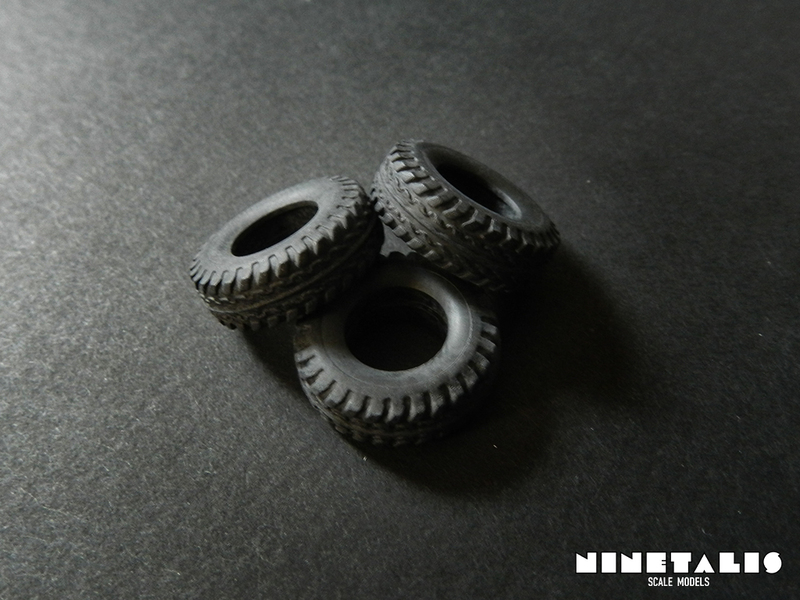 These are truly some of the best rubber tires I have seen in 1/48 so far. The tiny thread detail is astonishing to say the least. The thing is though, if you are not a fan of rubber tires like me, it is of course a little bit disappointing that there are no styrene tires included. It is however for you (the reader) to decide wether you like them or not. 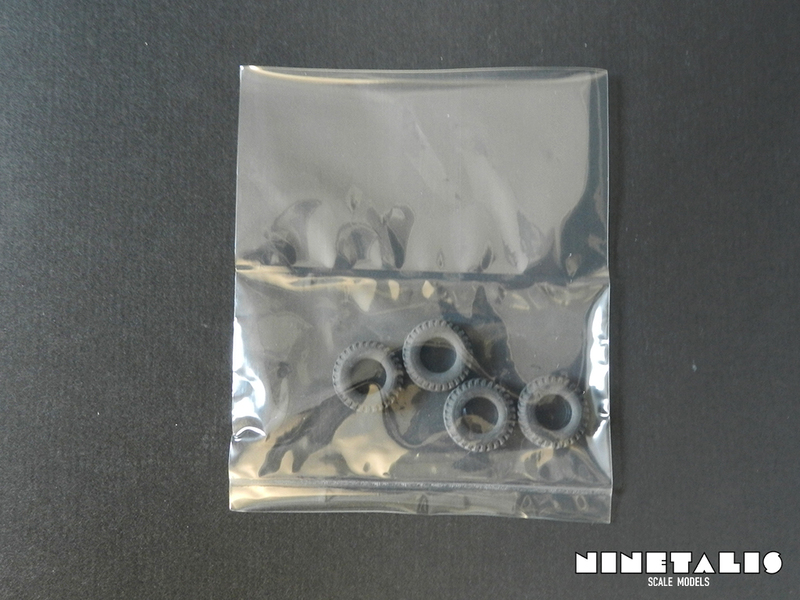 Luckily the aftermarket has provided several resin sets for people who want to address this. 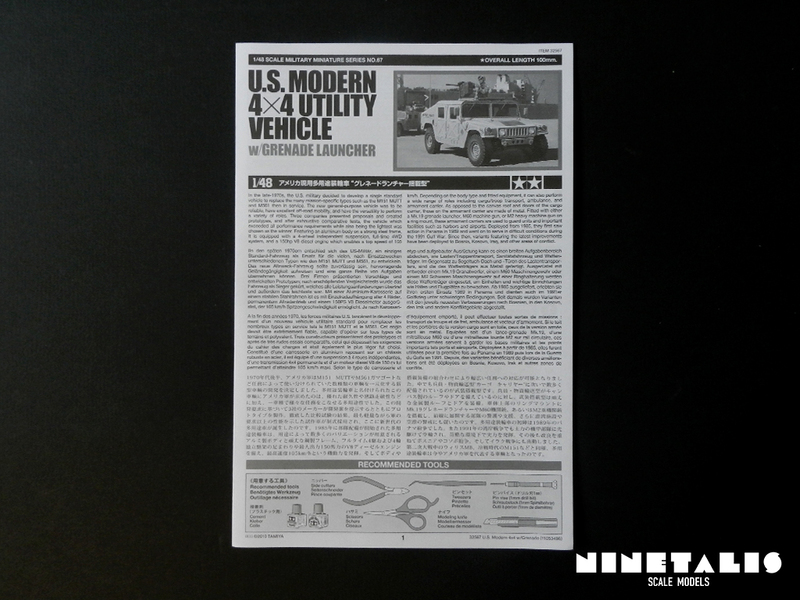 The decals included with this kit mainly provides the marking stencils of the added HMMWV’s. Also added is a decal for the instrument panel and the radio equipment. 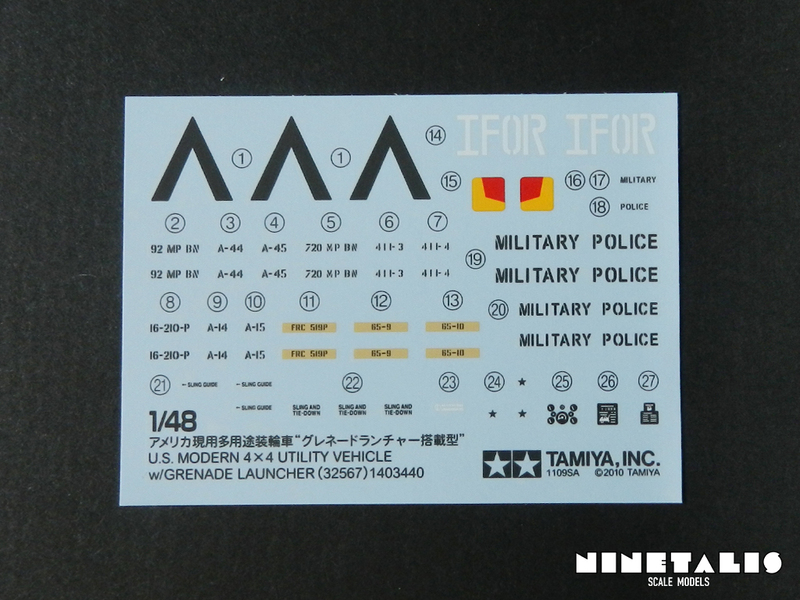 Overal the decals look good but do seem to suffer a bit from what all the Tamiya decals have problems with. The overflow is rather large and the decals also seem rather thick. 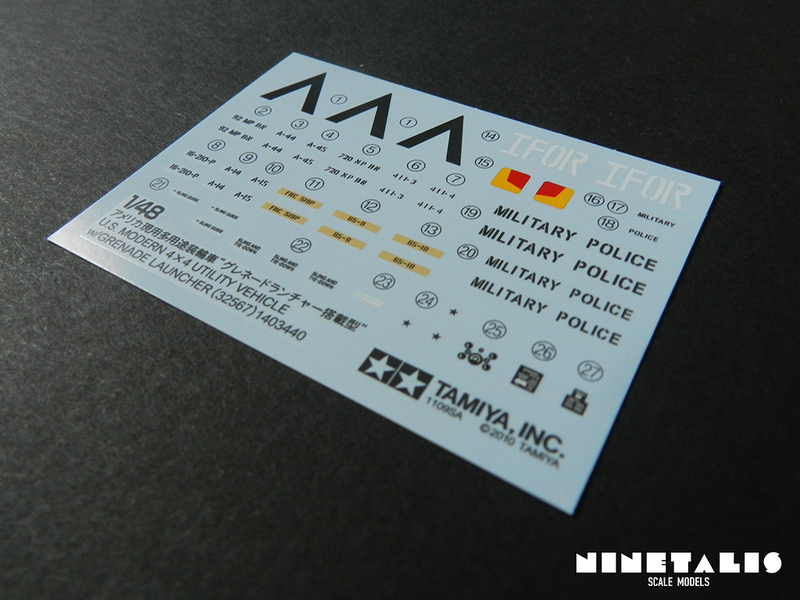 In essence I would say that if you handle this like how you treat other Tamiya decals, you’ll be fine. 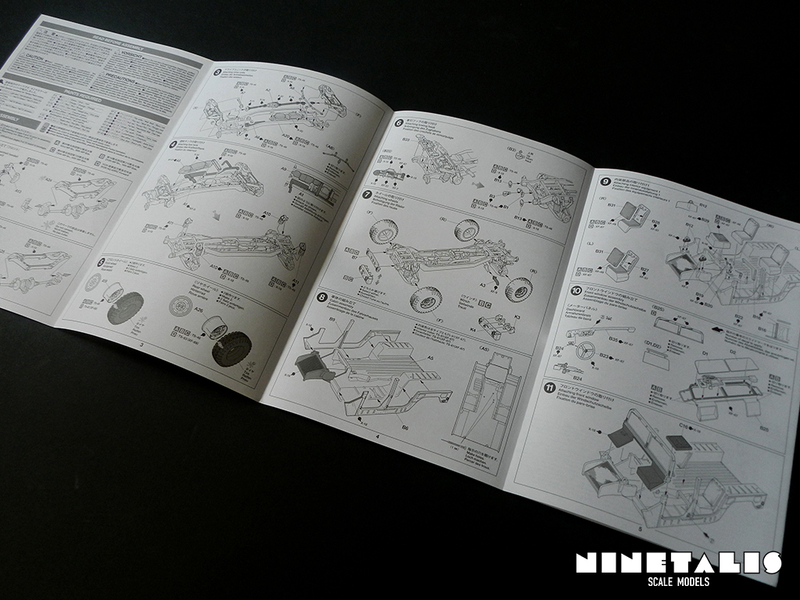 The instructions sheet is like any other we get from Tamiya, being roughly the size of an A4 sheet of paper which is folded together like a leaflet. 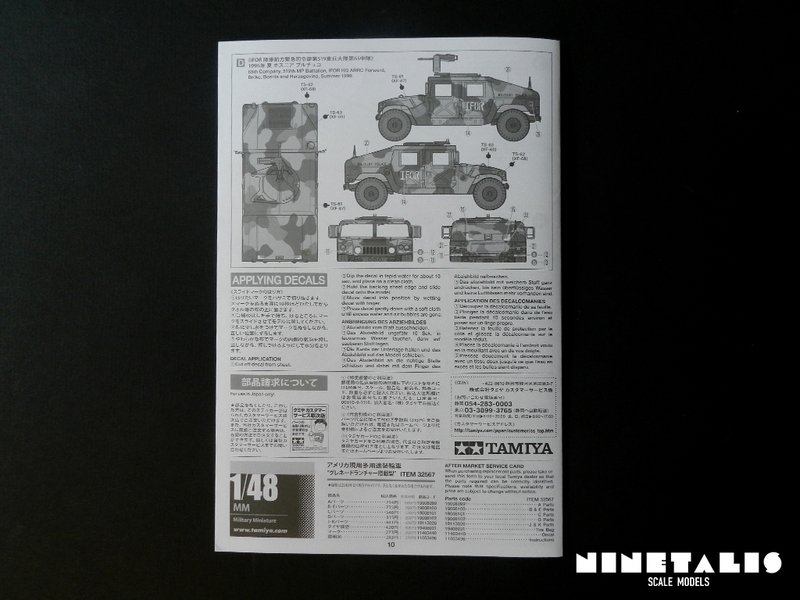 There is also nothing particular to note about the illustrations, as they look like any other from Tamiya. In total there are X steps, of which each has its substeps. It’s been a while since I have build one of these, but I can’t remember having any trouble understanding the instructions and their illustrations, although for the colours on the inside I would refer you to any sort of Humvee walkaround that you can find. As mentioned at the beginning of this review, we are provided with four different markings to choose from. The first three are painted overal TS-46 Light Sand. Two of these are Gulf War machines, one based in Saudi Arabia during October 1990, while the second was based at Camp Cobra in Iraq during February 1991. The third machine is also a machine based in Iraq, although no date is given. Luckily for those who are not interested in building a Gulf War model there is a fourth alternative. This is an IFOR machine operated during the Bosnia conflict during the summer of 1996. The paint scheme is also completely different from the three others, being a tricolor paint scheme consisting of Tamiya’s TS-61 NATO Green, TS-62 NATO Brown and TS-63 NATO Back. Brcko, Bosnia and Herzegovina, Summer 1996. All of the above machines were operated by Military Police forces. In my eyes Tamiya did a good job releasing this kit, as it can appeal to both aviation as armor diorama builders in 1/48 scale. 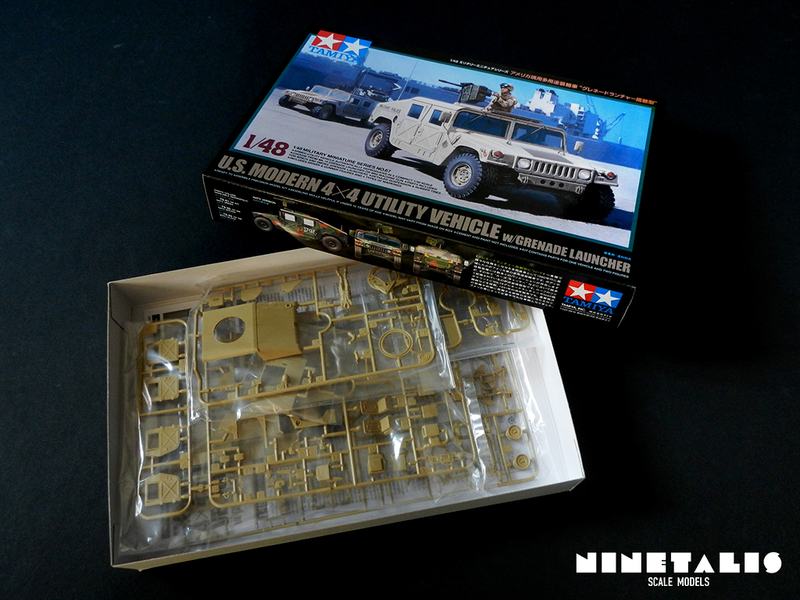 Although the molds of this are nearly a decade old now, they are yet to be challenged by another styrene Humvee in 1/48. It doesn’t mean however that this kit is faultless. For a 1/48 ‘car’ I find it rather pricey compared to other ‘car kits’ from Tamiya in the same scale. Add that personally, I’m not a big fan of rubber tires, but I know that for each person who dislikes rubber tires, there is another who does. To each his own. The others are that although we do get a hood/bonnet that could be displayed open, we are not provided with an engine to do so. At the same time in back we can not display the trunk open, as these pieces are molded into the main body of the HMMWV. If the builder really want to display the trunk in an open position, I’m sure some simple scratch building can make this possible. Last are the back lights, as these are also molded onto the back panel of the body. These are however small issues, because we do get an superbly detailed chassis which could almost be a model in its own right. The parts are extremely detailed and having build one of these years ago, I can wholeheartedly say that this kit is an amazing one to build with no real issues whatsoever. One that both beginners with no experience at all can enjoy, while providing a good enough kit for the most experienced of modeller will appreciate.